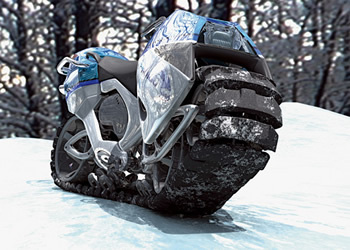 The Hyanide is a concept motorcycle created by German designers Oliver Keller and Tillman Schlootz for the 2006 Michelin Challenge Design competition. The tank-like tread of the Hyanide consists of 77 segments made from hard plastic covered by rubber all held together by Kevlar fiber rope. Since each segment flexes, the tread is much more flexible (and compliant to road surface) than a tire. Both wheels rotate into turns; the rider steers with hands and feet both. To turn left, for example, you’d push the right side of the handlebar forward, to point the front of the tread left—it’s the same motion as on a motorcycle. At the same time, however, you’d also push back on the right pedal, angling the rear of the tread into the turn. This action would twist the tread into a crescent shape and whip the Hyanide around a turn. Unfortunately (this is the "eyecandy" part), this device exists only as a one-fifth scale model. Hopefully, it will attract the attention of manufacturers at the competition. SF enthusiasts will remember another cool motorcycle design - the flycycle from Niven's Ringworld. And don't forget the real-life Ghostrider motorcycle from an earlier DARPA Grand Challenge.